I honestly don’t know how my husband and I made it through the three kids five and under stage. To put it quite frankly, there was no time for us. All of our time was devoted to the three little people who call us mom & dad. Every waking moment (and every sleeping moment) we were at their beck and call. I can’t even put into words how tired I was. Or how emotionally drained I had become. I spent all my time caring for three little people and had forgotten how to be myself, how to be a wife to my husband. Now that the children are a bit older and we’ve learned how to make time for us, oh how sweet it is to have reconnected with my husband. We are still mom & dad, and our kids are still a priority, but we’ve learned that romance after kids is possible! Talk about your relationship with your spouse before kids. Do you remember what it was like before you had kids? Do you remember how carefree and spontaneous you were? Plan a night to sit down with your spouse after the kids are in bed to talk and reminisce about your relationship before kids. Talk about where you met, how you felt when you first saw him/her, how nervous you were on the first date, how excited you were for the first kiss, etc. Be open and honest with your spouse and go back to those early days in your relationship. Unfortunately my husband and I had strayed so far away from those days, but we made our way back. It’s not impossible. With effort and determination, romance after kids is possible. Make a plan for the future of your relationship. Nothing makes me more motivated than having a plan in place. I’m a list maker and list marker-offer (totally not a word, I know) and I get so much satisfaction with a completed list. For some it may be too technical or planned out, but for me, it keeps me on task and mindful of what I need to focus on. My brain goes a mile a minute and unless I’m on task, I’m getting absolutely nothing done (although it looks like I am). Talk with your spouse about where you want to be a year from now. How do you want things to change, and how you will work towards that change. Talk about how you plan on getting back to romance after kids. Go back to the early days of your relationship and hold hands. I still get butterflies in my stomach when my husband reaches his hand for mine. It’s a little reminder that even through all the busyness of life and everything going on around us, at that moment he is still thinking about me. If your husband doesn’t reach for yours, reach for his. If it’s been a while since you’ve held hands it may be a bit awkward. But keep at it. It will get more familiar and soon, without even realizing it, you’ll be hand in hand every chance possible. Look into each other’s eyes. I feel so much closer with my husband when we are looking into each other’s eyes. We don’t get to look into each other’s eyes all that often, but when we do, it’s kind of a big deal. I feel like when we are able to spend that extra bit of time talking to each other, and looking into each others eyes, that we connect on a different level, if even just for a couple of seconds. Leave each other notes. My husband is pretty spectacular at this one. 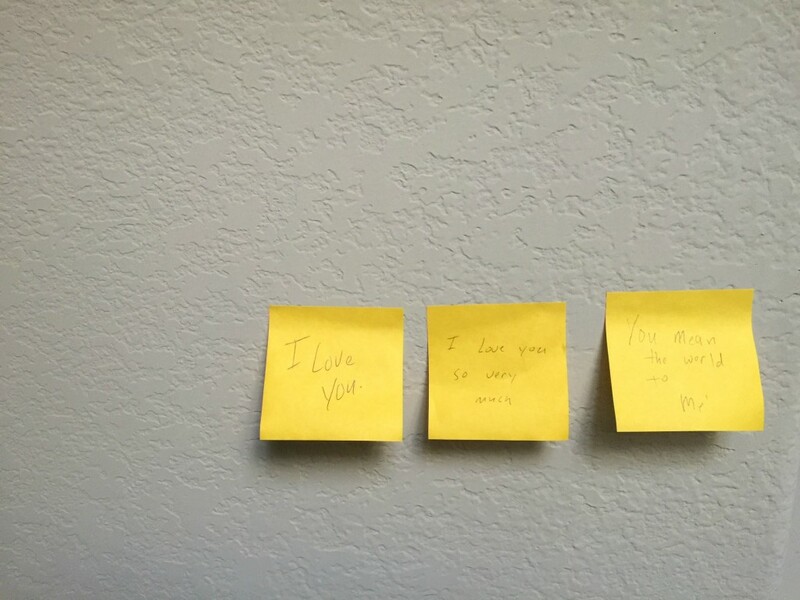 There are little sticky notes in my closet and office that he has left for me. I don’t throw them away, even though they are bright and yellow, but instead I keep them there as a constant reminder that he thinks about me and loves me. I’m not big on getting flowers all the time (although occasionally is nice), but leave me a love note and you’ve won my heart. Plan date nights. Romance after kids is NOT easy. It doesn’t just happen. You have to work at it. So with that in mind, plan date nights. It’s the best thing that we’ve done to work on our relationship. Whether you go on a date once a week, once a month, or once a quarter — go on a date with your spouse! Devote a few hours for each other. Keep the cell phones put away and just focus on each other. Don’t talk about the kids, but talk about your relationship. Or don’t talk at all — ahem. You are trying to get back to romance after kids after all. Make time for each other. To be honest, most of our time is for our children. They’re young, with tons of activities, and their needs come before ours. But just because you are mom & dad, doesn’t mean you’re not husband & wife. It’s so important to make time for each other. What you plan on doing with that time is up to you, but spending time with each other is the best thing you can do to strengthen your relationship and bring back romance after kids. 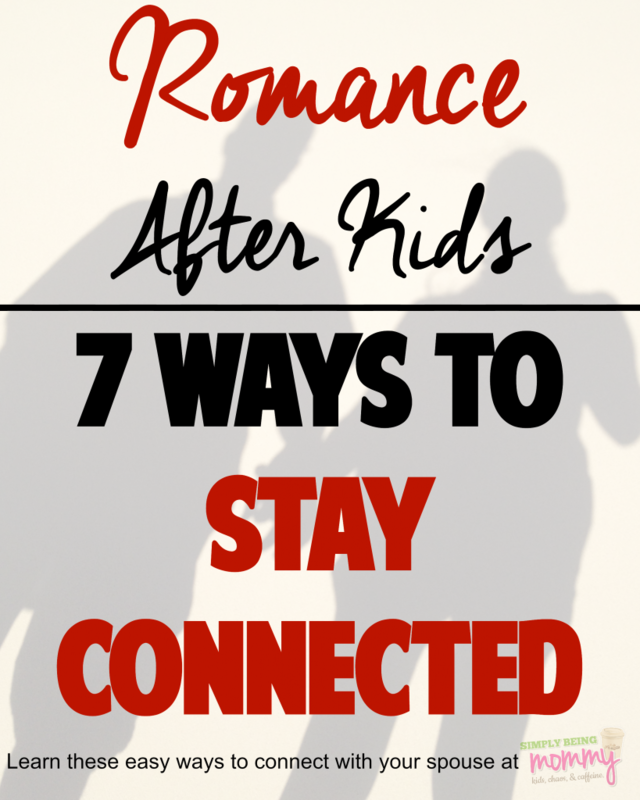 Staying connected to your spouse and experiencing romance after kids is something you have to work at. As much as you love your spouse and as much as you are devoted to him/her, you have to show them. While you may be head over heels in love with your husband, if you only say it, but never show him, how is he supposed to know? Same for your wife, guys. Show her how much you love her. Show her how much she means to you. Sweep her off her feet again, like you did when you first met. Wives, show him that romance after kids is important to you and that you’ll work on reconnecting. I know that putting your heart to paper can be difficult for some of us. I know that writing what your heart feels can be difficult to translate into written words on a piece of paper. I get it, y’all. But your spouse needs to know how you feel. They deserve to know how you feel. Go beyond the “I love you” and express how you really feel. And when the words don’t come easy, I’ve found that more times than not, I can find a Hallmark card that says exactly what I wanted to write, but just couldn’t. As a challenge this Valentine’s, I want you to think beyond “I love you.” If you’re up for the challenge (and I hope that you are), I want you to #PutYourHeartToPaper and write your heart on your own Hallmark card. It’s so easy to just sign “I love you” at the bottom of the card. But this year let your spouse know your heart. Tell them why you love them, what you love about them and how they make you feel. Even if the card says most of how you feel, elaborate and make it personal for your spouse. It might just be the best Valentine’s Day yet! Do you have any other tips for romance after kids? My husband and I go out on a date night every week. It makes it easy to stay connected when we have that much alone time. We’ve been married for 21 years 🙂 So we’ve been through all the stages from newly married, to having a baby, school aged child, teenager and now an adult daughter. Truly the thing that has kept the romance alive the most during all that time was doing little things for each other when not expected (like your love notes). My husband will unload the dishwasher for me before he leaves for work and I get up in the morning, or I will leave a couple of wrapped dark chocolates in front of his computer for him, just small tokens like that. Those are all great tips … but most of them are things my husband won’t do. He’s not a romantic, hand-holding or a reminiscent guy. We do make time for US though – and that’s huge! Great ideas! My husband and I would also grab a shower together. The kids were so used to us being in the bathroom at the same time it wasn’t a big deal for them. Even if one of us jumped in as one was getting out- we had a few minutes of talking without someone pulling at us. I really like #1 🙂 That one is AWESOME! And makes kids happy too. These are some great tips even without kids! Especially after several years of marriage, it’s important to remember that it takes some effort to keep a relationship strong. Those definitely are some great tips to keep romance alive in a relationship–married with or without kids-or just at the dating stage-Letting the other person know how you feel is very important-no one os a mind reader! Date night once a week has worked for us, more so now that our 3 children are grown. Keeping your passion alive is what it’s all about. All of these tips are great for the older folks, too. Sometimes we just “forget” what it was like to be romantic, but we can still be prodded gently to remember. Planning date nights is so important to keep the romance alive. Having time away from the kids can really help you reconnect. These are great tips! I think it’s a good idea to leave each other notes. Doing these things really helps keep the relationship healthy. It can be so fun to go on dates together! Such great tips! It can be so hard after kids! I agree…romance does suffer after having kids. But you’ve offered some great tips here and right in time for Valentine’s Day! I’ll be putting some of them to use! These are really great tips. You can’t forget, over everything else, your love for each other. After all, it’s that love which made your family possible. Hubby and I still occasionally leave eachother notes. It still gives me butterflies to see little reminders like that, knowing he still loves me as much as he did 14 years ago. There are so many ways to keep the love alive.. I could be better at a few of these things. Great tips! My mom always taught me to never stop dating your spouse. It is definitely hard finding close moments together when you have kids. I definitely need to make it more of a priority. These are great reminders! We didn’t do this and after 20+ years of marriage you can see the damaged it has caused. I highly recommend making each other a priority when the kids are small and continuing that over the years. I got lucky and my mil takes my kids every Sunday afternoon so hubby and I can have a few hours to ourselves. We don’t do dates on those days. Maybe a quick lunch, or a trip to the home improvement store. This is something we’ve done for 15 years and I think that’s how we have stayed so well connected all these years. I’d like to do more date nights with my hubby. The little things are so important. Date night is especially important. It hasn’t always been a priority for us but we are making it that way. It’s so easy to get caught up in the kids. Loved your tips. Continuing to date is so important after kids and just after a long time of marriage. Its so easy to loose touch with each other with how busy life is. I bet this is wonderfully helpful for people with kiddos. It really is all about the communication, little love notes work wonders and you can never neglect date night. Great tips. Date night is mandatory. We can’t go every week due to work schedules but we do go a few times a month. Since we can’t go out every week we do spend time alone at home. And, a few times a year we take a little road trip for a day or two to recharge our batteries with no responsibilities. These are wonderful tips. I am single and have been for over 10 years now but if I were to get into another relationship, I’d do these all. Now… I do take myself on a date once a week. I have to or I lose my sanity. I just go out, browse thrift stores, eat, go to a local coffee shop, pedicure…whatever. Something to treat myself! My husband does contract work and gets to work from home often, so we have date lunches. And sometimes date nights. We always tell each we love each other, hold hands, and show affection. We want our son to see this and know this is how a strong, healthy marriage should be. these are great tips. We really learned to take advantage of every few minutes we get to stay connected. These are all great tips. It can be hard to make time for each other after kids but it’s so important that we do. These are fantastic tips! My husband and I have to remind ourselves to do this. Cause even though our kids are older we still sometimes forget. We really need to be better about date nights. I just feel that when the weekend hits we are exhausted! I love this, it’s all about keeping it fresh and new! Thanks for the reminders. Such great tips. We still go on dates and have snuggle time in the morning when we’re both not working. This is one thing I’m not good at. I’m not a very romantic person, my husband is more romantic than I. Same here, Colleen. I am working on it, though. 🙂 But my husband is wonderfully romantic. What! There IS romance after kids? Lol. Just kidding. Yes, I know my marriage suffered with each baby, but now that we are done… and the older kids aren’t quite so needy, we have started to enjoy each other again. For us it has been spending time and talking. I think touch is so important… your tip on hand holding is important, so is a back rub or just a hug. I enjoy having a close relationship with my spouse. For us it starts with the little things. Making time is a huge thing, I love date night. #2 has been a recent topic with my husband and I. Having something just for us to look forward to is really nice. We’re planning a get away in a few months. I’m excited. Thank you for the tips! We definitely haven’t had time for each other like we used to since we had our second last year. Our older son had turned 4 and was our only child, so we had just started to be reminded of what time together could look like- and then we had a baby and started all over. It’s important to work to stay connected and these are perfect tips! Thank you so much for these wondrous tips! I definitely need more date nights with my hubby! We have two kids, one is three and one is one :). It’s so time consuming, exhausting, stressful,… I could go on forever. Our relationship suffers off course. I don’t feel lack of love, just lack of us being alone. This Valentine’s Day we wanted to spend on a dinner but it won’t be possible (again). So, let’s hope for a better future on this one! What a sweet list. You’re right that keeping the romance going is important, but I must admit it’s something I struggle with and let fall by the wayside far too often. But this is a nice reminder that making time for a little romance doesn’t have to be some huge orchestrated event. 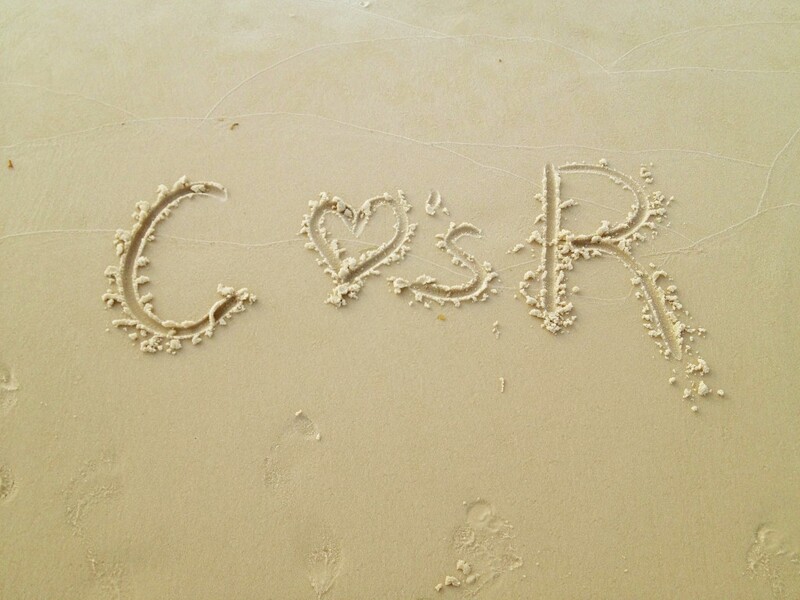 Sometimes it’s the little ways that couples continuously show love for one another that mean the most.